There is a new star shining bright on the Norwegian culinary scene and it’s all about classic French fine dining. With one stellar review after another this haute cuisine establishment definitely strengthen Oslo’s position on the world food map. Most foodies don’t associate fine dining with the Norwegian capital. A contradiction as Oslo on several occasions has been revered as one of the best cities in the world to live in, with a high standard of living and Lonely Planet even naming the kingdom’s premier city as one of the top cities to visit in 2018, highlighting the food scene as one of the main factors with the three Michelin-starred Maeemo as the crown jewel of the crown. Yet the Norwegians, who live comfortably from their fortune of black gold, haven’t managed to transform this comfort into the classic luxury dining since the 00′-heydays of the beloved Bagatelle. Until 2017, when Restaurant À L’aise opened its doors. Since the opening À L’aise has been hailed for bringing a high level of classic French cuisine back to the city, with a large amount of both critics and food lovers praising the quality and high standards of the restaurant. 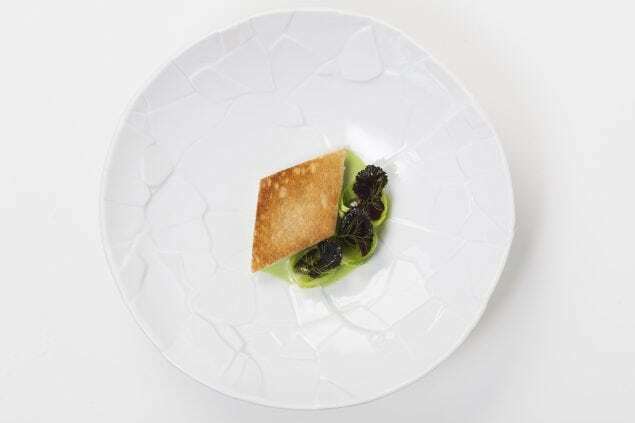 The reviews have been near perfection, with critics acknowledging the restaurant as Oslo’s best new contender for Guide Michelin, not to mention a time of culinary Belle Époque-glory. The name À L’aise originates from the French translation of the word “comfortable”, which is exactly what is to be found here. The soft wall-to-wall carpeting, the subtle and warm color scheme and subdued lighting immediately set the tone for a relaxed and, yes, comfortable mood. “While I was in high school I got a part time job at a French restaurant in Copenhagen named L’Education Nationale. 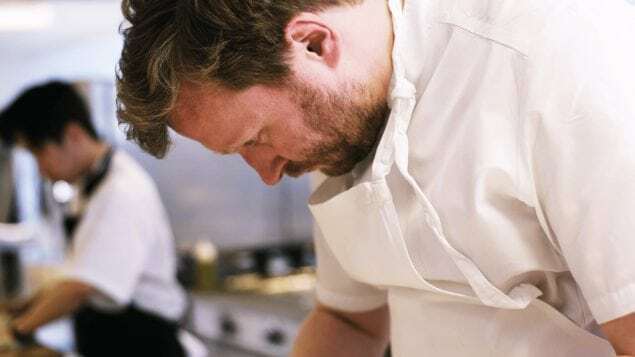 That was when my heart started burning for French cuisine and to this day I clearly remember how the scent of a Boeuf Bourguignon could spread in the kitchen with such immense volume and power”, Ulrik explains to Honest Cooking. Purveyor of Opulence, Chef Owner Ulrik Jepsen. 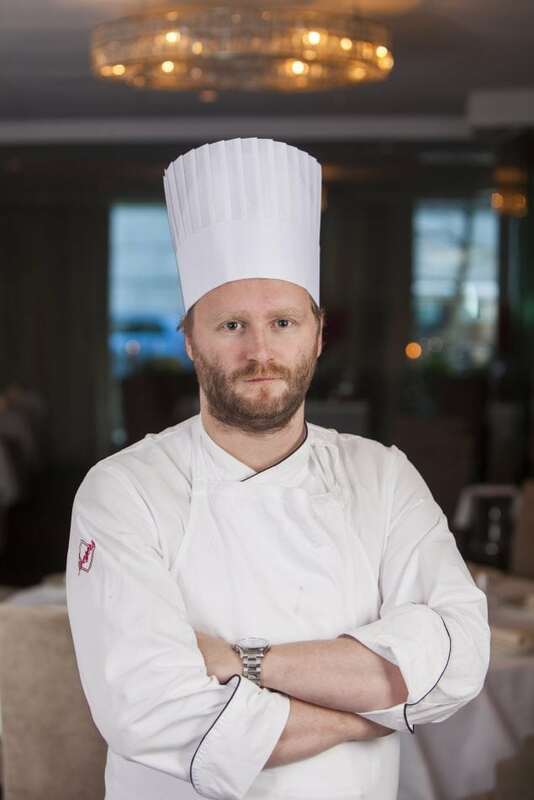 His gastronomical journey would later bring him by acclaimed Danish restaurants such as Søllerød Kro, Hotel D’Angleterre and Kokkeriet, as well as a stint in Moscow all while packing his proverbial backpack with new techniques and experiences – while cultivating his love for French cuisine. By 2015 he returned to Engø Gård – this time as the head chef, where his reputation and skills ensured the restaurant one exceptional review after another. He remained there right up until the possibility of opening Restaurant À L’aise presented itself in the dawn of 2017. Although the cuisine of Restaurant À L’aise resembles that of Engø Gård, there are some key differences. With the latter being a hotel serving guests both for breakfast, lunch and dinner, including occasional night snacks as well. 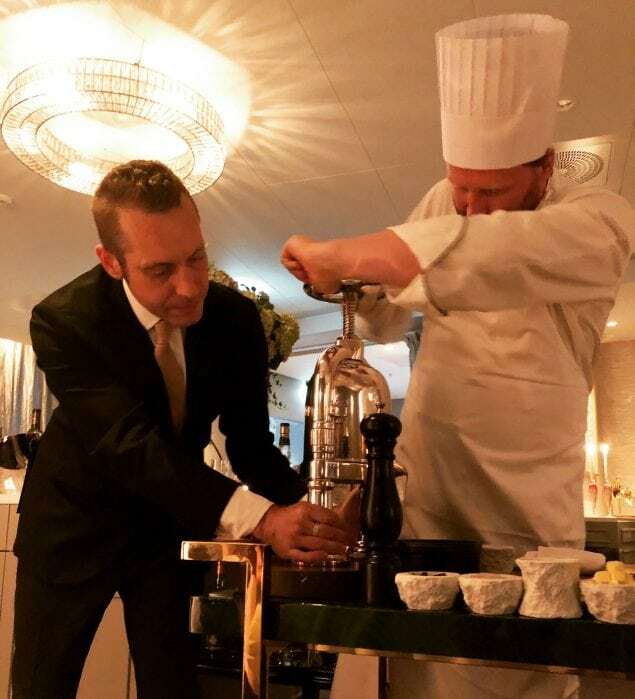 The style of À L’aise lets Ulrik focus solely on serving dinner for his guests, ensuring they get a top-notch creation that has been exquisitely prepared to the highest of French standards. The menu consists of what you would expect a high-end French restaurant to serve, and as Ulrik explains it’s the high quality produce that is the main focus. 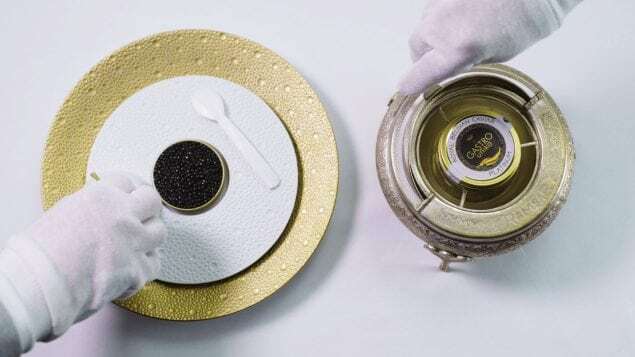 Pristine caviar is a delicacy continuously to be found on the menu. “We don’t try to mask the products – on the contrary we present a very honest and transparent menu. An example is the Reine Claude Plums. When a guest orders the course, the technique of cooking it is very honest. We blanche the plum for 3 seconds, remove the skin and take out the stone and serve it immediately after. This way of thinking about gastronomy is very beautiful and honest and requires the perfect ingredients”, Ulrik explains. The inspiration to create these meals starts with the delivery of the products. Twice a week a truck with produce from Norway and France arrives, which lets Ulrik inspect the products more thoroughly. He explains that people aren’t giving enough credit to the people who actually bring you these products. 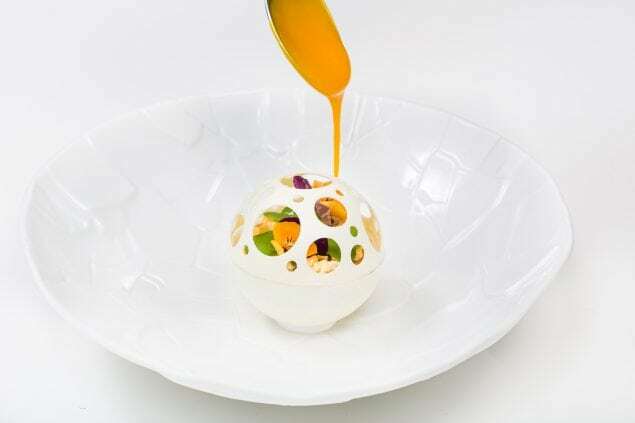 As a chef he believes that in the end it’s his job to transcend the product into a final presentation, but without high quality produce, this would simply be impossible. “I’m only as good as the produce I have in my hand”. With a vision that a restaurant should constantly be evolving, Ulrik doesn’t believe in signature dishes, but he does however highlight one specific dish a must try when you visit the restaurant; the Canard à la Presse (pressed duck). 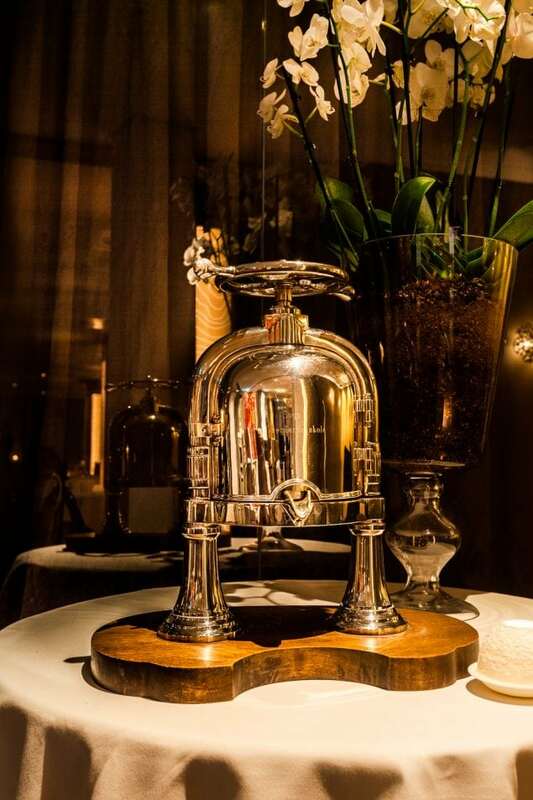 The diligently used silver duck presse that also serves as visual entertainment for the diners. “The short version: the duck is dried for four days in order to keep the skin crisp, and is then left to mature for 3-4 weeks. Basically what you do is you put the duck (without the breasts and legs) into our custom-made duck press, made of real silver. You press the carcass to extract the blood and juices of the duck. The breasts are returned to the kitchen, and you now have 8 minutes to prepare the sauce at the table in front of the guests before the duck breasts have been cooked. The sauce is made by flambéing duck hearts with the blood and cognac and the experience is very visual and impressive for the guests”, Ulrik explains. 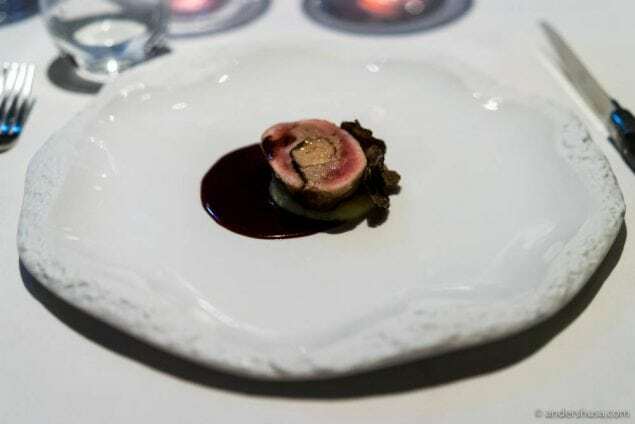 He also mentions, the Due en Crepinette (pigeon) with Périgord truffles and Foie Gras is another true definition of French cuisine on the menu. Due en Crepinette with Périgord truffles and Foie Gras. Photo by Anders Husa. With the menu consisting of such classic French dishes, it would be hard to see how exactly À L’aise differs from so many other French restaurants. This, however, is where Ulrik’s Northern Europe upbringing plays a pivotal role. The “classic French with a personal twist” is also applied to the interior of Restaurant À L’aise. 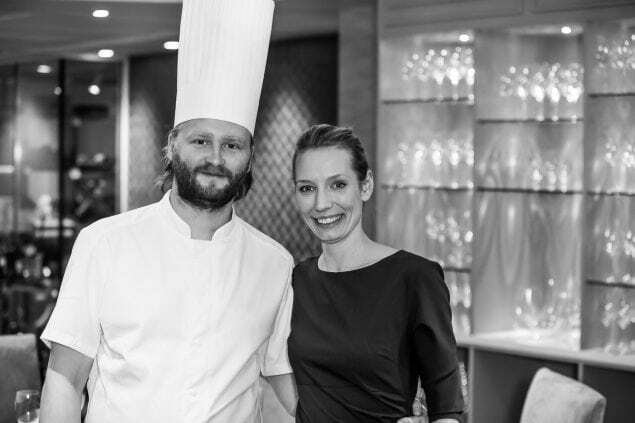 Ulrik has been with his wife for 6 years, and together they have created the whole look of the restaurant, with financial aid from their investor Jan Nielsen. Their goal was to create a restaurant where things are familiar but leaves you surprised by some elements. Urik and his wife Mia, the couple behind the creation and growth of À L’aise. “When you work with your life partner, the communication is always on point. She understands my vision for the place and executes it to perfection. We have given the dining room our personal touch by adding elements that have personal value for us. We’ve constantly tried to follow the sentiment of how the guests would feel, rather than how industry people or critics would feel. All in all while keeping the sense of familiarity. It all comes back to feeling comfortable”. And as you enter the dining room, that sense of familiarity adds to comfortable atmosphere. The dining room is decked out in old fashioned luxury with classic silverware, firmly pressed tablecloths, long-stemmed champagne glasses and porcelain suitable for high tea with the Queen herself. The tables, that combined seat 40 guests for dinner service Tuesday to Saturday, are all circular to ensure a more relaxed ambience, with enough distance between them to easily allow private conversations. Classic items that you would expect to find at a chic Parisian restaurant you’ll likewise find here, including both a champagne and avec trolley, as well as a cheese trolley with a selection of 32 different cheeses carefully selected from all areas of France. 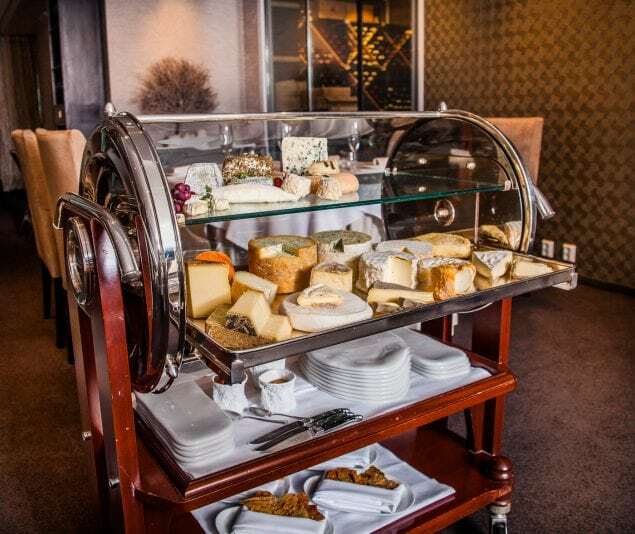 Alors… An impressive cheese trolley of the finest French selection. A typical French dish served. Turbot en croute with sorrel and winter cabbage. 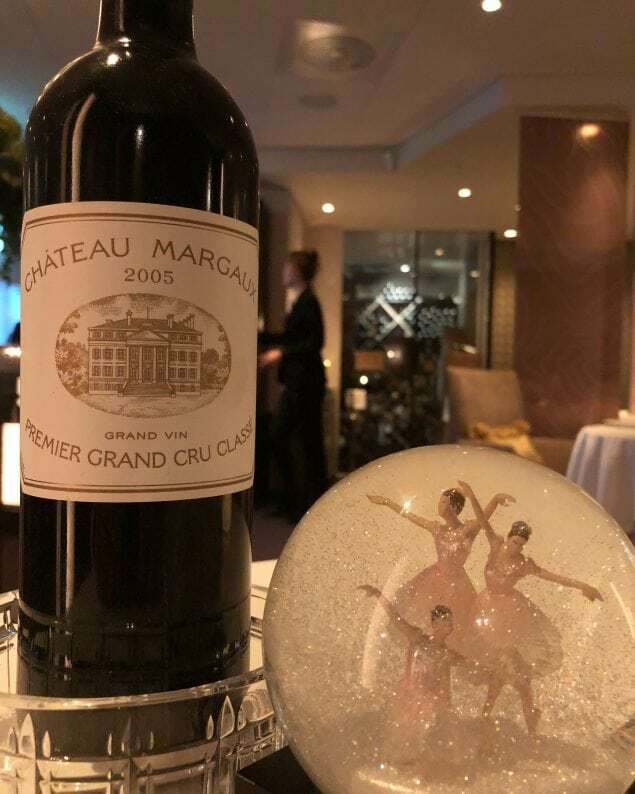 Margaux magic in the restaurant. Although he does believe that Oslo lags behind other Northern European capitals like Copenhagen and Stockholm when it comes to gastronomy, he believes Oslo slowly but surely is making a name for itself, and explains that initiatives like “Kokkenes Dag” (Day of the chefs), where several local restaurants, including À L’aise participate in a 1-day food festival, with up to 10.000 customers, are helping to put more focus on the city of Oslo as a foodie destination. The path is set for Ulrik and his family for the immediate future and they are currently walking it. Ulrik acknowledges that opening a project as grand as À L’aise is time-consuming and requires that you sacrifice several years of your life to seeing it through. And although his passion for French cuisine has been shining brightly since the beginning, he’s not closed to venturing into other food styles. “If I wasn’t doing this, I would probably buy a wooden hut in Tuscany and cook old school Italian food, with no cellular phone and stomping my own grapes”, he jokingly says. WOW! Stunning! I love French cuisine! Norway and French, a perfect mix of ingredients!